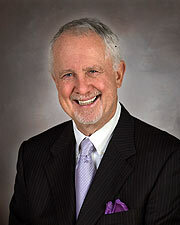 Richard Andrassy, M.D., has been head of the McGovern Medical School Department of Surgery at UTHealth since 1994. He is the longest-serving surgical department chair in the United States. He is also the only pediatric and general surgeon in Texas who counts both adults and children as his patients. A baseball player in college, Dr. Andrassy started playing golf at age 44, and was lucky enough to get to play with Greg Norman, Arnold Palmer and Jack Nicklaus. “That motivated me to play better!” he says. It also meant he’s been taking care of pro golfers for decades. Dr. Andrassy grew up on East Coast, and still has family living in Florida. Here in Houston, he and his wife have six grandchildren to entertain. In his spare time, he reads Early American history and novels for relaxation. Surgery was a success which is the most important part. However everything else about my experience was very poor. Dr. Andressy is the best physician I have ever met! He is very read up and experienced. We went to three other opinions yet Dr. Andressy was far more informative about my [...] case than any other by far. He didn't seemed rush in the least, something we couldn't say about other physicians. He handled our child with dignity and my [...] responded to him with complete trust, even with a smile! Dr. Andressy is without question our specialist! [...], I was very impressed with Dr Andrassy and his nurse. At first I thought I would only see the helping physician but when Dr. Andrassy arrived, he was exceptional. The provider was excellent. Felt very confidant in his expertise and abilities. Patients are seen at the UTP Pediatric Surgery clinic, and the Minimally Invasive Surgeons of Texas clinic.